Average fans of A Christmas Story likely don’t know that director Bob Clark had once made creepy horror pictures with Alan Ormsby, but this independent shock effort of the early ’70s still casts a spell of dread. Although Vietnam is never mentioned, the war’s shadow strikes deep into the heart of a small-town family. John Marley and Lynn Carlin lead a fine cast. Anya Ormsby, Jane Daly, Michael Mazes. This gem comes back every ten years in an improved transfer. Bob Clark and Alan Ormsby’s Canadian-financed Deathdream is one of the many productions inspired by George Romero’s Night of the Living Dead. It was denied the wide theatrical release that made successes of shockers like the notorious Last House on the Left. Originally titled Dead of Night, Clark’s picture dribbled slowly onto movie screens under several different names. The English periodical The Monthly Film Bulletin didn’t have a chance to praise it until 1977. The lofty reputation of this creep-show was established on late night television, where its qualities shone through grainy green prints. Its excellent dramatics more than compensate for a low budget and commercial compromises. Some critics had already opined that films like The Wild Bunch and Night of the Living Dead were metaphors for (or symptoms of) the Vietnam experience. Clark’s bizarre chiller was one of the few movies of the time to have an overt connection. Bob Clark was a truly eclectic moviemaker. Now a holiday staple, his A Christmas Story shows no trace of being by the same man taht filmed the sleaze-bucket Porky’s or the pre-Halloween slasher Black Christmas. A much more accomplished film than Clark and Ormsby’s Children Shouldn’t Play With Dead Things of the previous year, Deathdream is graced with an excellent cast to portray a dysfunctional family crumbling under the stress of The War Back Home. Beloved son Andy might be the kid from A Christmas Story, grown up and sent off to a war, where merely getting one’s eye shot out might be a blessing. Andy Brooks’ first name also elicits memories of MGM’s old Andy Hardy series. What if the fresh kid played by Mickey Rooney got killed on Iwo Jima, and came home as a ghost? America was in denial about the true cost of the Vietnam War. Ormsby’s concept makes some fine connections. Hiding in his room, being anti-social, Andy Brooks shares behaviors with Benjamin Braddock of The Graduate. The macabre zombie notion is borrowed from the classic story The Monkey’s Paw, which is not about war. But other cautionary tales do involve dead soldiers returning to warn the living. In pacifist Abel Gance’s two versions of J’accuse, French graveyards yield forth Romero-like armies. Disfigured corpses confront the complacent living, demanding to know why their sacrifice was thrown away. It’s heavy-handed but very spooky. Much more recently, Joe Dante directed the gleefully mordant political shocker Homecoming, using the zombie subgenre to protest the outrages of a neocon Presidency. Deathdream remains interesting because it ‘brings the war home.’ The evil of the war is expressed indirectly, in family confrontations. Vietnam is never even mentioned. Andy says a few mysterious things about making his victims ‘pay the way he paid’ but his specific agenda is unclear. Although we see Mom pray for Andy’s safety there’s no direct telegraphing that Andy-Zombie is a direct answer to his family’s wish that he return, as in The Monkey’s Paw. We have to work at it. Andy’s vampire ghoul needs blood to keep from decomposing at an accelerated pace. He murders outsiders that interfere with his mission. One killing in a drive-in seems the payoff for all those scenes of ‘necking teenagers attacked by monsters’ in old movies. When Andy turns on his old girlfriend, the situation becomes a nightmare alternate reality version of American Grafitti. Deathdream’s fine actors rally around the established, talented John Marley and Lynn Carlin, both noted for their roles in John Cassavetes’ Faces several years before. Clark stages the domestic scenes with a fine simplicity. He frames some shots through doorways, as if we were peeking in on a Norman Rockwell-like tableau. What we remember most are the looks of bewilderment on dramatically framed faces. Anya Ormsby’s Cathy is upset by her mother and father’s sudden personality changes. Andy causes Dad to retreat into drinking and morbid self-doubt. Mom’s denial becomes ferocious, and the family ceases to function. Richard Backus at first looks a little pasty-faced and inexpressive, but as we begin to perceive the malice in his eyes he becomes a terrific non-standard bogeyman — the loved one that can turn Manson-crazy without warning. The supporting roles are interestingly cast, and Anya Ormsby and Jane Daly give especially expressive performances. 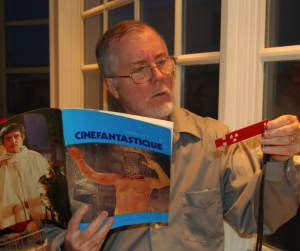 Director Clark has a part to play, and writer Ormsby appears in a cameo. He looks like a young Ned Flanders with bushier hair. Without explicit pointers, we recognize Andy’s curse as a poetic backlash from the war, showing senseless carnage returning to its source: You want to go to war, to send your children to kill strangers? This is the price. The conventions of the horror film merge with a vague and unspoken sense of guilt. The beautifully sustained mood overrides minor flaws along the way. The picture isn’t always distinguished-looking and some of the gore effects are on the obvious side. A generic ‘jungle battle’ prologue is somewhat amateurish. Yet we believe the basic drama. Andy’s character has the inconsistency of a dream phantom. When the shocks do come, they’re highly original. The satisfying ending critiques the notion of ‘closure,’ that Americans seem to think washes away guilt and complicity in shared tragedies. Mom gets closure, all right: when Andy finally seeks to be laid to rest, she helps him prepare his own grave. The violent car chase to the graveyard, with one car on fire, is a wicked variation on a funeral procession. The sobbing Mother could not bear to face the death of her son, but when push comes to shove she’s instinctually capable of helping him do what he has to do. The finale is like a reversal of the birth process that only a mother could understand. For a picture composed mainly of genre shocks and mayhem, Deathdream is unusually compassionate with its characters. Like Larry Cohen’s Q: The Winged Serpent, this film leads with its performances. The superior dramatic confrontations are just that, better than what we’re accustomed to in genre pictures. Clark and Ormsby’s Children Shouldn’t Play With Dead Things wasn’t much more than the student-film lark, but this much more accomplished show backs its genre chills with substance and gravity. Not too many horror films succeed as social comment, but Deathdream is a powerful exception. Blue Underground’s Blu-ray + DVD of Deathdream is a major advance over the earlier DVD release (2004), with an improved image and sound. The HD scan brings the sometimes- grainy cinematography to life, and the improved color and sharpness are a definite boost. The show colors are probably an accurate approximation of the original cinematography. Unlike Children Shouldn’t…, this show was filmed in 35mm. BU has retained its impressive roster of extras. Director Bob Clark and writer Alan Ormsby each offer interesting, thoughtful commentaries. Clark drifts somewhat (and his voice is boomy and somewhat unclear) but he definitely has the straight dope on his show. He is quick to say that John Carpenter didn’t steal the concept for Halloween from his Black Christmas. Ormsby has a better memory for details and praises his director partner’s casting acumen. One extra is a short subject on the makeup man, Tom Savini: The Early Years. A good single interview with veteran Zombie Richard Backus called Deathdreaming, was directed by David Gregory. Neither featurette oversells the significance of the movie, which remains an obscure secret pleasure. An Alan Ormsby student film may be a new extra, along with several new interview pieces (see below). One interview is with Ormsby and his star Anya Liffey, formerly Anya Ormsby (her IMDB credits appear to be scrambled in two separate entries). An alternate title sequence substitutes the Deathdream main title — the title on the feature is the original Dead of Night, which can’t help but conflict with the 1945 English classic Dead of Night. An alternate ending is also almost identical, with one or two shots extended by a few seconds. The gallery of ad art shows more alternate titles, suggesting that the movie’s commercial flaw was its inability to find a suitable title — distributors kept changing it. They also didn’t luck onto a good image for the ads. Andy’s toothy death’s head grimace is eerily disturbing in the film but looks bland on a poster. That’s the problem with a truly original movie that doesn’t follow the strict contours of a genre: how do you sell the darn thing to a public that wants something different, but the same? Deathdream is a morbid and uncompromising original, a feel-bad psychodrama that carries an uncomfortable ring of truth. Supplements: Audio Commentary with Co-Producer/Director Bob Clark; Audio Commentary with Writer/Make-Up Artist Alan Ormsby; A Recollection with Star Anya Liffey and Ormsby; Notes For A Homecoming interview with Composer Carl Zittrer; Flying Down To Brooksville interview with Production Manager John Bud Cardos; Tom Savini: The Early Years featurette; Deathdreaming Interview with Star Richard Backus; Alternate Opening Titles, trailer, still galleries; Alan Ormsby Student Film. Plus illustrated booklet with new essay by Travis Crawford.